Kwame Alexander checked out the book selection at the Lafayette Public Library in Lousiana, where he told stories and performed parts from his recent books for children. 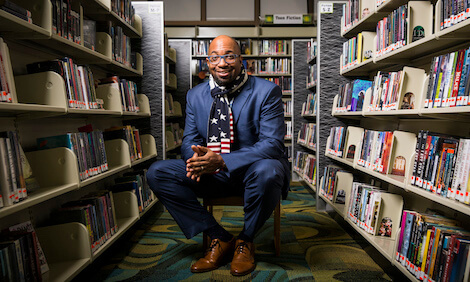 This has been a big year for writer Kwame Alexander. So far, he has released a new book called Rebound and toured 21 cities to share it with students. He is also overseeing his own imprint, called Versify, for publisher Houghton Mifflin Harcourt. An imprint is a new brand that a publishing company creates to produce a special line of books. Versify will publish books that Alexander thinks may not otherwise be published. He wants to focus on picture books, novels, poetry, and nonfiction written by people from different cultures and ethnicities. He also wants to seek out books written in other languages that could be translated into English. Alexander grew up in Brooklyn, New York, and Chesapeake, Virginia. His first name “Kwame” comes from the country of Ghana. “Kwame” means “born on a Saturday,” but Alexander was born on a Wednesday. The home he grew up in was filled with books. His mother was a teacher and eventually became a principal. His father was a college professor as well as a book publisher and Baptist pastor. Kwame wrote his first poem when he was twelve years old. It was a present for his mom on Mother’s Day. Alexander decided that he wanted to be a writer while he was in college. At first, he studied medicine, but after taking a writing class at Virginia Tech, he decided he wanted to be a poet. His teacher was the well-known poet Nikki Giovanni. She gave him a “C” in that first class, but he took more classes with her and his writing improved. Giovanni became a mentor to him. After college, Alexander moved to Baltimore and gave poetry readings at coffee houses, universities, and community centers. In Baltimore, he also worked with teachers who were helping children learn how to read. He started his own publishing company and sold copies of his self-published poetry books. In 2005, he put aside his publishing company to focus more on writing. His young adult book called The Crossover came out in 2014. This breakout book won the Newberry Award. The Newberry Medal is one of the biggest prizes you can get for writing children’s books. Since then, Alexander has published six other children’s books. The Crossover has appealed to many young readers with its coming-of-age story told with rhyming lines of poetry. Alexander often visits schools to talk to young readers. He calls these visits “literary pep rallies.” They involve performances of Alexander’s poetry in which students participate in call-and-response rhyming sessions. Some kids even get to perform on stage with him. At one school, Alexander answered questions with superfans at a special lunch after one of his pep rallies. Alexander works hard to bring the joy of reading to students. He uses writing to inspire young people and leads writing workshops to help mentor young writers. He believes that poetry can change the world. Visit Kwame Alexander’s official website to learn more about his life, his books, and his special events. Check out this video to see what Kwame Alexander’s “literary pep rallies” are like. What does Kwame Alexander believe can change the world?